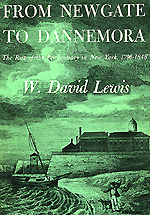 . . . . No American state was more deeply involved in penal pioneering than New York, which revamped its old methods of punishment in 1796. Led by a Quaker merchant named Thomas Eddy, reformers secured the passage of a law abolishing the death penalty for all but three crimes and prescribing lengthy prison sentences for most major offenses. This action launched New York upon a course of penitentiary management which in time made it the avowed rival of the state from which it had all but copied its first modern penal code -- Pennsylvania . . . Following the removal of British restraints, Pennsylvania soon became a leader in adopting new methods of dealing with criminals. . . . authorities turned to protracted confinement as a preferable policy. The legislature passed a series of laws prohibiting liquor in jails, establishing separation of the sexes among inmates, appointing official prison inspectors, separating debtors from felons, restricting indiscriminate visiting of jails, and providing solitary confinement for the most hardened offenders. Capital punishment was again reserved for first degree murder. 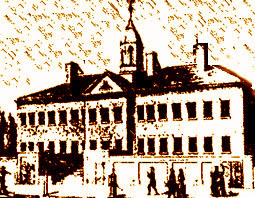 The Walnut Street Jail, a Philadelphia institution upon which construction had been started before the Revolution, now began receiving felons from all parts of the state. Walnut St. Jail sketches, above and below, do not appear in From Newgate to Dannemora but do appear on this web site in a NYCHS excerpts presentation of On the Penitentiary System in the U.S. and Its Application in France by Gustave de Beaumont & Alexis de Tocqueville Clicking either of the two images will access the page where they appear with a descriptive quote about the Walnut St. Jail from the 1949 Handbook of Correctional Institution Design and Construction, United States Bureau of Prisons. Strong support for new methods came from members of the Society of Friends, reflecting the Quaker belief that any man - even a criminal - possessed a share of the divine “inner light” which could be reached and nurtured through proper treatment. The reform movement, however, was broadly based, enlisting the efforts of such men as Episcopal Bishop William White and the prominent physician Benjamin Rush. Inspiration also came from abroad through the writings of the great English prison reformer John Howard and the achievements of Sir Thomas Beevor, who had established a model jail at Wymondham, Norfolk. Influential citizens in New York observed the correctional reforms in Pennsylvania with interest. Especially conversant with the new measures was Thomas Eddy, who had been reared in Philadelphia and knew various humanitarians there. As a Tory in the Revolution, Eddy had experienced a brief taste of wretched jail conditions. As a merchant, he had reason to desire a penal code in New York which would protect property more effectively than the ill-assorted and unevenly executed sanguinary punishments that prevailed there. As a Quaker, he believed that many criminals could be reformed if subjected to firm but humane treatment. Eddy, who eventually came to be known as the “John Howard of America” . . . was a quiet crusader who knew how to interest the right people in his ideas and had marked abilities as a lobbyist. . . . he became well acquainted with General Philip Schuyler, father- in-law of Alexander Hamilton . . . 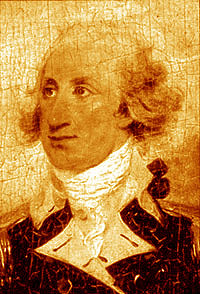 Keenly aware of the prestige which the General’s name would bring to the cause of prison reform in New York, and of the power which Schuyler wielded as a state senator, Eddy persuaded his friend to visit Philadelphia with him in the winter of 1796 and inspect the Walnut Street Jail. Schuyler was impressed with the institution, and helped Eddy draft a bill for the establishment of a penitentiary system in New York . . . They arranged to have Ambrose Spencer, a powerful political leader, introduce the measure, and Schuyler spoke strongly in its support. The John Howard profile above does not appear in From Newgate to Dannemora but does appear on this web site in a NYCHS excerpts presentation of The History of the Office of Sheriff by Schenectady County Sheriff Harry C. Buffardi. Clicking the image -- logo of the John Howard Society of Canada -- will access the page about British Sheriff reformer John Howard. Eddy played his part during the debates by having copies of the Pennsylvania penal code distributed freely among the lawmakers and by being present as a lobbyist. When the act was passed on March 26, 1796, he was placed on a four-man committee empowered to build the state prison and that body in turn gave him primary authority to supervise this task. . . . .
His theories on the treatment of criminals owed much to the writings of such men as Howard, Montesquieu, and Beccaria. The penitentiary which he built in New York showed considerable European influence, even to the point of being named "Newgate" after the famous English institution. . . .
[American] prison reformers . . . took it for granted that the felon offended both man and God, and that the church as a guardian of moral order and social stability had an important part to play in the treatment of lawbreakers. By this time, however, other concepts had also assumed great significance. According to the theory of deterrence, inflicting pain on an offender was justifiable because it discouraged others from following his example. The idea of reformation, on the other hand, led many to believe that the treatment of a criminal, whether painful or otherwise, should make him a better person. These two philosophies, not really antithetical but nevertheless difficult to reconcile in practice, were part of America's intellectual inheritance from the Old World. . . . Such inflictions as whipping, maiming, and killing were attractive to law-enforcement officials not only because they could easily be witnessed by spectators and thus have some deterrent effect, but also because they were speedy and cheap. Occasionally it was profitable to confine felons and force them to row galleys, build public works or to perform various other useful tasks. In other cases, as in ancient Greece, incarceration became a common alternative punishment for offenders who could not — or would not — pay fines. The Philip Schuyler portrait above does not appear in From Newgate to Dannemora but is based on one that does appear on the New York State Museum site in the People of Colonial Albany section. Click the image for a Schuyler bio by Stefan Bielinski. By and large, however, the prison as a place of punishment or corrective treatment is a modern innovation. Until the eighteenth century it was usually only a place of temporary detention for untried suspects, political enemies of the state, holders of heterodox religious views, and insolvent debtors. One important organization, however, did manage to gain considerable experience over the centuries in providing institutional treatment for convicted offenders. During the Middle Ages the Roman Catholic Church gained special criminal jurisdiction, within certain limitations, over clergymen and members of religious orders. Excessively severe punishments could, and sometimes did, occur under the use of this authority; but the fact that most offenders preferred to be tried by ecclesiastical courts rather than by civil ones indicates that the penalties inflicted by the former were usually more lenient than those meted out by the latter. Because of this relative clemency, the privilege of “benefit of clergy” became more and more widely sought, and was gradually extended not only to a variety of minor church functionaries but also to anybody who could read certain passages of Scripture. Offenders tried by clerical courts could be sent on long pilgrimages or required to make protracted fasts. However, they might also be remanded to ecclesiastical prisons, where the punishment they experienced was justified as curative, being designed to bring about repentance and amendment of life . . . the Church of Rome cannot easily be disregarded in discussing the rise of the modern penitentiary. Monastic institutions were designed in part for those who wished to spend lives of expiation and atonement, and the discipline practiced in them had much in common with the regimes imposed upon convicts by later European and American prison reformers. Subsistence upon coarse food or shortened rations; the wearing of distinctive, and in certain cases humiliating, garb; abstinence from sexual and other excitements; the contemplation of past transgressions, accompanied by resolutions to make future amendment; the use of a cellular form of living accommodation; and the encouragement or absolute requirement of silence —all these were features of monastic life which may conceivably have influenced the thinking of those who built and administered prisons in the late eighteenth and early nineteenth centuries. Interestingly, writers on penal reform in ante-bellum America occasionally noted the pertinence of early monastic precedents to their arguments. Catholic establishments for juvenile delinquents were also significant in foreshadowing subsequent correctional developments. 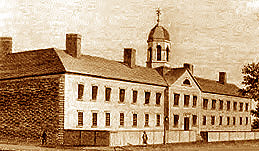 The famous Hospice of St. Michael in Rome influenced such reformers as John Howard, and some writers have attempted to trace a line of descent connecting this institution, the Maison de Force at Ghent, and the New York state prison at Auburn. Scholars have also found interesting anticipations of modern penological theories in tile ideas of such Catholic thinkers as St. Thomas Aquinas, Dom Jean Mabillon, Fra Filippo Franci, and Pope Clement XI. . . .